2019 - EVERY NAPA VALLEY, SONOMA, RUSSIAN RIVER WINE TASTING DEAL RIGHT HERE! LOOKING FOR THE UPDATED LIST OF NAPA, SONOMA, AND RUSSIAN RIVER WINE TASTING COUPON OR DEALS? HERE IT IS, UPDATED JAN 2019. To get these Napa and Sonoma wine tasting deals just purchase the Priority Wine Pass for $39.99. You only need ONE pass per couple and the savings add up fast! JaM Cellars (Downtown Napa):- 2 for 1 tasting flight ($20+ SAVINGS) Known for: Chardonnay, Sparkling, Red blends…open LATE! Wine Train Gourmet Lunch or Dinner: (Downtown Napa) $25 off tickets pass members and up to 3 guests ($80 Savings) Reservations required please call (707) 253-2111 and mention you are a wine pass member during booking. At check-in please bring ID and wine pass to obtain special pricing. Castello Di Amorosa Wine Train Tour: (Downtown Napa) $25 off tickets for pass members and up to 3 guests ($80 Savings) Reservations required please call (707) 253-2111 and mention you are a wine pass member during booking. At check-in please bring ID and wine pass to obtain special pricing. Collective/Estate/Legacy/Famiglia Wine Train Tours: (Downtown Napa) Receive $35 off tickets for pass members and up to 3 guests based on availability ($140 Savings) Reservations required please call (707) 253-2111 and mention you are a wine pass member during booking. At check-in please bring ID and wine pass to obtain special pricing. Ceja Vineyards (near Carneros Brewery in Sonoma) 15% off in-person wine purchases ($20SAVINGS) Known for our Pinot, Sauv Blanc, Chardonnay, Rose, Red Blend, Merlot, Syrah, Cab, and Late Harvest/Dessert Wine. V Cellarplace (Yountville): 2 for 1 tasting experience and 15% off wine purchases ($25+ SAVINGS) Known for: A bit of everything! Rutherford Ranch Winery (Silverado Trail St. Helena): One Complimentary Tasting per wine pass (BY APPT ONLY) : Enjoy a selection of four to five wines from our portfolio, both red and white wines, rotated seasonally ($40 SAVINGS) Known for: Cab (several only available at the winery), Sauv Blanc, Chardonnay, Merlot, Zin and Rhiannon, a proprietary red blend. V.Sattui (St. Helena): Two for One Tastings ($20 SAVINGS): Known for: CABS but they have over 60 varietals and several sweet wines! Madrigal Family Winery (Calistoga): Complimentary Private Tasting for 2 with two bottle purchase….By Appointment Only & Vineyard Lunch with tasting for $85 (normally $100pp)($70 SAVINGS) Known for: Cabernet Sauvignon, Petite Sirah, Gewurztraminer, Zinfandel, Sauvignon Blanc and small lots of single vineyard and estate wines. Envy Wines(Calistoga): 2 for 1 Tasting before Noon ($20 SAVINGS) Known for: Syrah, Cab, Petite Sirah, Red blends, Rose, Sauv blanc, and Late harvest! Bennette Lane Winery (Calistoga): Complimentary Upgrade to a Private Seated Tasting for Priority Wine Pass Holders (valued at $70 per couple) for our Signature Tasting Price of $40! Limited to groups size of 6 or less and by appointment only. McEvoy Ranch (Petaluma): 2 for 1 bar tasting with reservation ($20 SAVINGS) Known for: Pinot Noir, Syrah, Montepulciano, Grenache, Viognier, and Olive Oil. Ceja Vineyards (near Carneros Brewery in Sonoma) 15% off in-person wine purchases Known for: Pinot, Sauv Blanc, Chardonnay, Rose, Red Blend, Merlot, Syrah, Cab, and Late Harvest/Dessert Wine. Cline Cellars (Sonoma): 2 for 1 Reserve Tasting and 10% off wine purchases ($15+SAVINGS) Known for: Zin, Mouverde, Chardonnay…and they really have it all. Muscardini Cellars (Kenwood): 2 for 1 Tastings and 10% off wine purchases ($15+SAVINGS) Known for: Single-Vineyard Designate Zinfandels, Syrah, Cabernet Franc, Cabernet Sauvignon, Chardonnay, Bordeaux-style blend and Late Harvest Zinfandel. VJB Vineyards(Kenwood): 2 for 1 Tastings ($15SAVINGS) Known for: Italian Style Wines and they also have a wonderful Deli. Sapphire Hill (Healdsburg): 15% discount on wine purchases, 20% discount on all case purchases & complimentary tasting with bottle purchase ($10+ value) Known for: Sparkling, Moscato, Gewertz. Every trip to Napa should have at least one BIG adventure, the winery experience that caps off your wine tasting vacation. Take the Sterling Tram? Tour the castle at Castello di Amorosa? Visit the caves of Del Dotto? Yes, all good options but for me the BEST Napa experience is the Conn Creek Winery Barrel Blending Experience. And yes, I have a discount but that comes later. What I love about Conn Creek's Barrel Blending Experience is that how it makes you define what you like in your wine. I mean, I drink a lot of wine and I know what I like but if you asked me to describe it I get all befuddled. Umm, tar? Leather? Plums? Yikes, my cover as a self proclaimed wine expert is shattered. Look, I took notes which helped me when I started blending. At the barrels making the mix. This guy looks pro. Here's my blend - it's a good one! Almost done, pouring it into a bottle. But not anymore. That's because I went to the Conn Creek Barrel Blending Experience, a 90 minute "class" where you taste 6 different cabs grown in different areas of Napa. Like a good student I took a few notes and honed in on what I liked and what I didn't like in each, which was a good thing because before I knew it I was taking my little eyedropper and mixing up a glass like I was some sort of scientist. And then after some tweaking I was kneeling in front of the barrels and carefully measuring out quantities of each to make up my own blend. I call it Local Wally Reserve Cab. It's limited - very limited! Conn Creek's blending seminar is super cool, a quick way to get a wine education that's valuable to everyone from newbie wine lovers trying to understand what they like to industry insiders who want to further their knowledge. And it's fun - no stuffy classroom setting - and afterwards you go straight to the tasting bar to try all of their wines. You like wine, you'll love this experience. Cheers! This is super fun! And the winner?? Or is he? After waiting a month I invited my wine blending group over for a blind tasting. Will our wines hold up? Will we still love them? And who made the best? We wrapped the wines in foil to hide the labels and surrounded ourselves with wine glasses and sipped like the experts we had become. Surprisingly, all four bottles tasted very different from each other. My wine started off as big, bold and nearly over the top but as it sat open and we tasted more I noticed that the LW Reserve was the one we all gravitated to., Well, at least that's how I remembered it. In truth I think all of us could defend our wine blends to the end, just like real wine makers. The winner - the one we all secretly thought was our own - started off soft and drinkable and remained complex without going over the top. It wasn't mine. Damn! Everyone needs to do this. I mean, everyone! It's fun, it's educational, and the wine tasting competition a month later lets you bring home the Napa experience for your friends and family. And won't everyone be so impressed when you say things like how you wanted a bit more boldness so you added a drop of Petite Verdot and how the Cab Franc really sends the aroma over the top. Oh you wine expert you. TIP: Save your cards with your measurements on it because if you LOVE your wine you can have Conn Creek make you up a custom case. Now that's cool! This is the winning formula! Get a $50 discount with a Priority Wine Pass. Get your pass here, it's $39.99 per couple so the card already more than paid for itself. And remember, get the pass and I'll build you a stop by stop agenda to make sure you get your money's worth. OK, sure, it's still $100 per person after the discount but figure you get to take home a bottle of Napa wine that you made - most Napa wines are at least $60 - $75 per bottle these days - and you got to taste at the bar (normally $25 per person) - and you got a wine education that you just can't get anywhere else - so a hundred bucks is really a bargain. Highly recommended for my readers, skip the tram ride and the crowds at the touristy wineries and do the Conn Creek Blending Experience! Special Thanks to Winecountry.com for the list. Always a good idea to contact the wineries directly to verify before coming in. Anthony Bourdain knows what I'm talking about. He says to skip the Eiffel Tower when visiting Paris, to not fight the crowds at the Louvre, to take a selfie in front of Notre Dame but not go in. Instead he goes to a bistro, orders wine and cheese and gets into the local scene. That's my advice for Napa and Sonoma. You want to see Mondavi, go to your supermarket shelf. You want a tram ride, go to Disneyland. But if you want good wine, if you want a wine tasting experience that surprises and delights and surpasses all expectations, then you need to follow me. 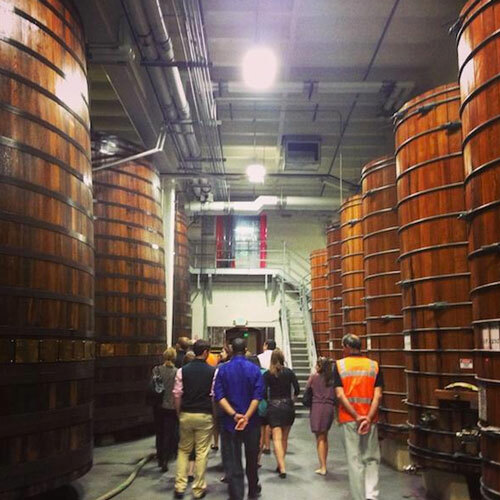 No doubt, winery tours are the essential field trip experience for first timers. But do you really want to walk through the hot vineyards or stare at a stainless steel tank? 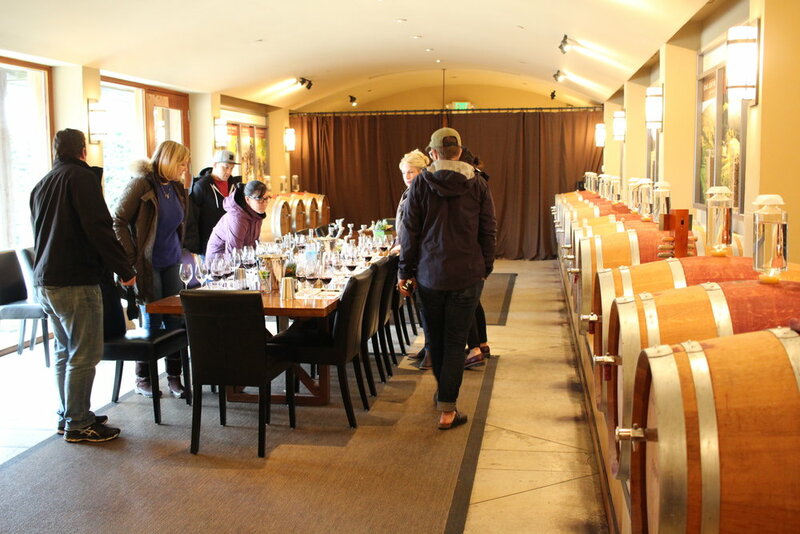 No, you came to taste wine and that's why I love Bell Wine Cellar's Grape to Glass Tour, a 90 minute experience that's mainly focused on tasting wine, not looking at it. 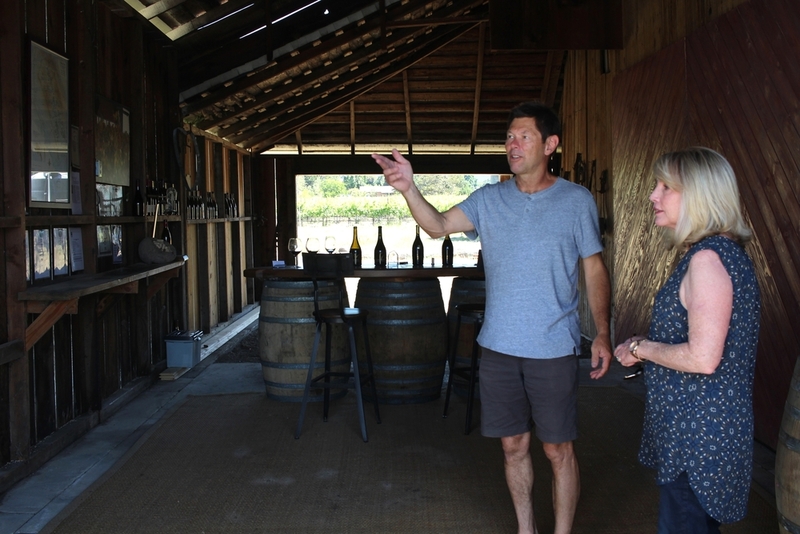 There's a bit of vineyard talk, a bit of barrel talk, but mainly it's tasting deep inside the winery and tasting, from sparkling wines to deep Napa cabs. The wines are serious but the tasting experience fun for all levels, it's my favorite tour for first timers and wine lovers. DEAL: 2 for 1 WITH PRIORITY WINE PASS - NORMALLY $50 PER PERSON. This doesn't look like a winery at all. There are no big screen TV's, no hostess, there's not a tour bus in sight. Instead of a sign there's a mailbox with the address. 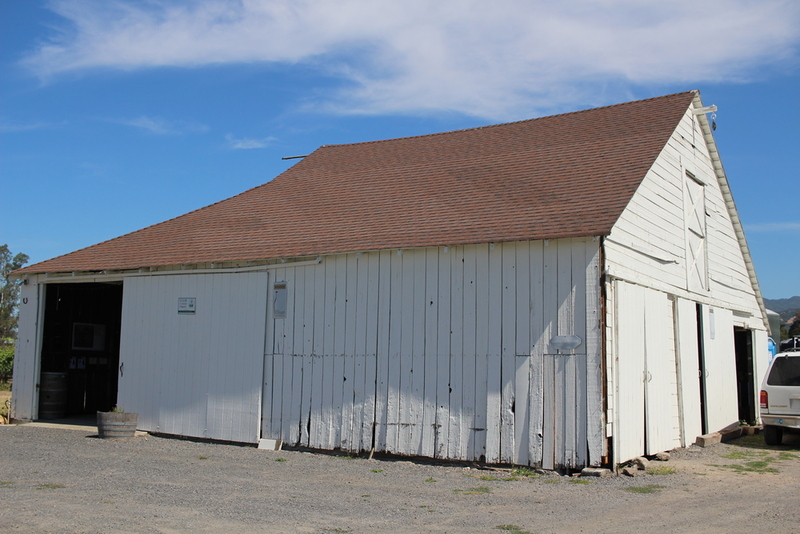 Instead of a tasting room there's a barn. 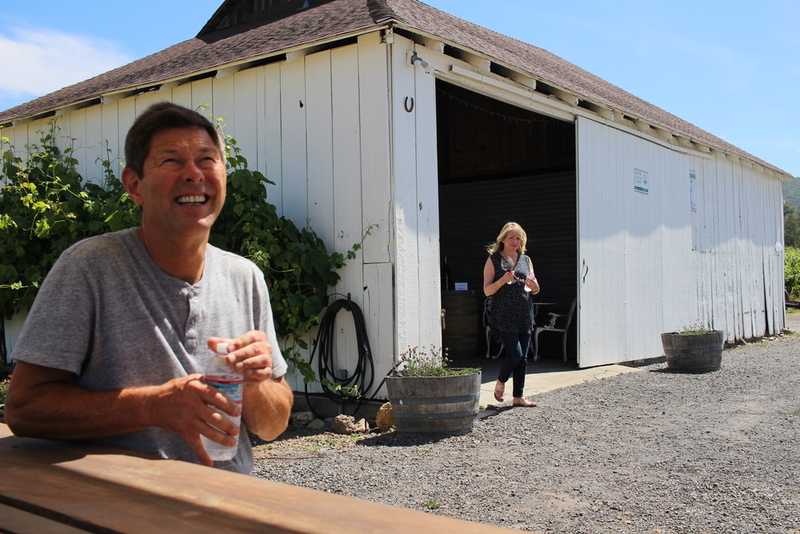 And inside the barn is Bill Canihan, the guy responsible for making some of the best Pinots in all of Napa and Sonoma. This is no prop, no marketing creation, Canihan is unpretentious and honest, a hard working guy making wine he hopes you will love. It's my latest find, my favorite new "hidden" winery, make reservations and experience Canihan Wines. Pity the fools who are lining up to try to get another sip at one of the big mega wineries. 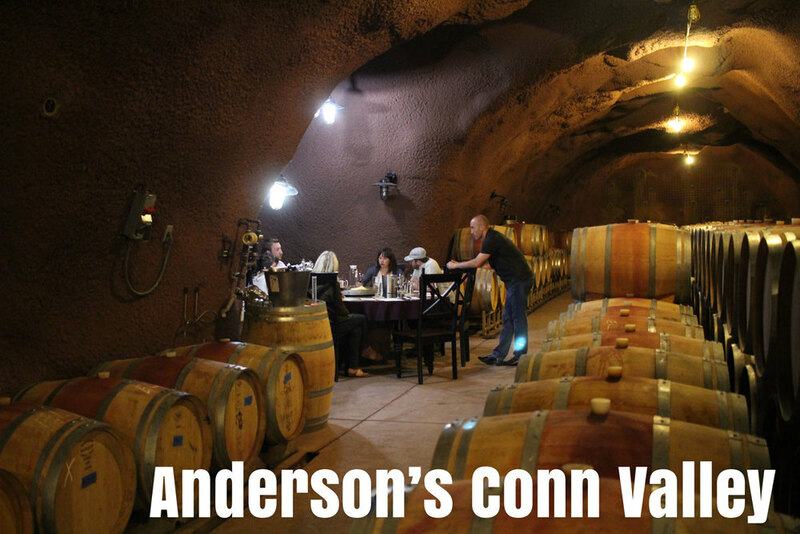 Anderson's Conn Valley Vineyards takes you deep into the caves with a small group to sample some of Napa's most exquisite wines. Barrel tasting, of course, and you can even reserve a spot to do some wine and food pairing with the winemaker. 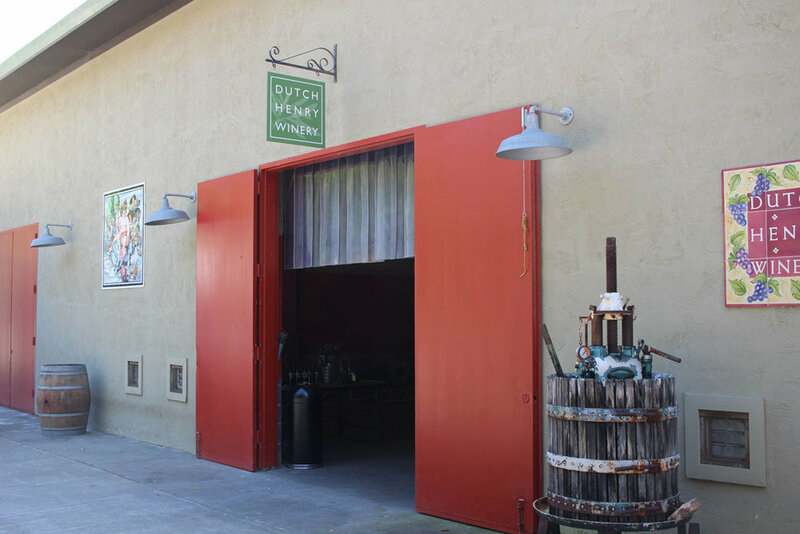 An industrial building for tastings, picnic tables under the trees, bocce ball next to the vineyards, Dutch Henry is a hidden gem in the Calistoga area. Make reservations and you can even taste inside their caves, an incredible experience. Make this your last stop of the day and give yourself enough time to buy a bottle to sip under the trees. Relaxing and fun. Tip: Bring some cheese and bread for a delightfully low key picnic experience. 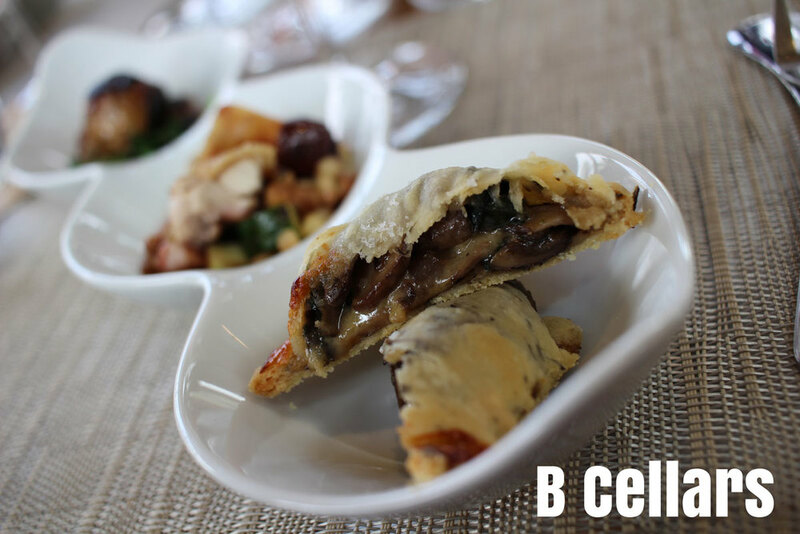 Wine and food pairings taken to the extreme, B Cellars goes beyond the nibble of cheese and expands it into a four course meal. The four course pairing costs $135 per person but those with lighter appetites (and wallets) can still experience B Cellars with a $60 food pairing experience that takes you through the gardens, caves, and back to a seated table where the chef is preparing tasty bites to go with each wine. Outstanding experience for those who love food as much as they do wine. DEAL: VIP OAKVILLE TREK TASTING, $300 PER COUPLE INCLUDES TASTING, TOUR, FOOD, PAIRING, AND TWO SIGNED BOTTLES IN WOODEN GIFT BOXES WITH PRIORITY WINE PASS. Unlike the big wineries who see thousands of people a day these small boutiques have limited visitors. Therefore, visit them expecting to buy a bottle or two (or more), of course assuming you like their wine. If not it's always a nice gesture to tip the person who poured your wine - standard restaurant tipping rules apply so a $50 tasting = $10 tip. Get these deals and many others with the annual wine pass. The Priority Wine Pass is the easiest way to get Napa deals and discounts without jumping through hoops. No tweeting before tasting from a phone app, no searching for an expired coupon, just flash the card or image on your phone and get these and other Napa tasting deals!